The first thing I must make perfectly clear is that rattlesnakes are dangerous and not to be trifled with. 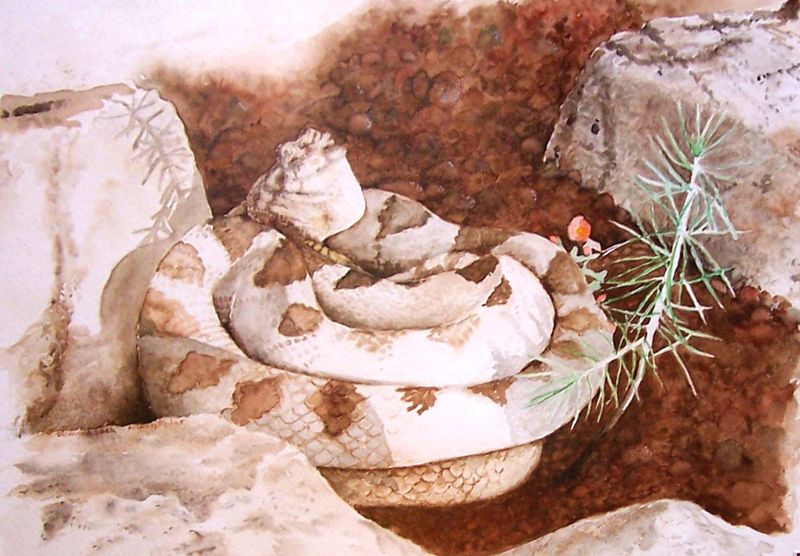 A woman who was in a watercolor class I was teaching told her story of growing up on a ranch in Arizona, and how she and her siblings would capture rattlesnakes, get them into a paper bag, vigorously shake the bag, and give it a big toss. Don’t do this. Other than the inherent cruelty, there are just too many things that can go wrong. Fortunately, they lived to tell their tale. Where we live in New Mexico there are 5 native species of rattlesnakes, with the most common being the western diamondback (Crotalus atrox). I have encountered 3 of the 5 species in the creosote brush where we live. One of them, the black tailed rattlesnake (Crotalus molossus), I found in my garden placidly resting under squash vines. 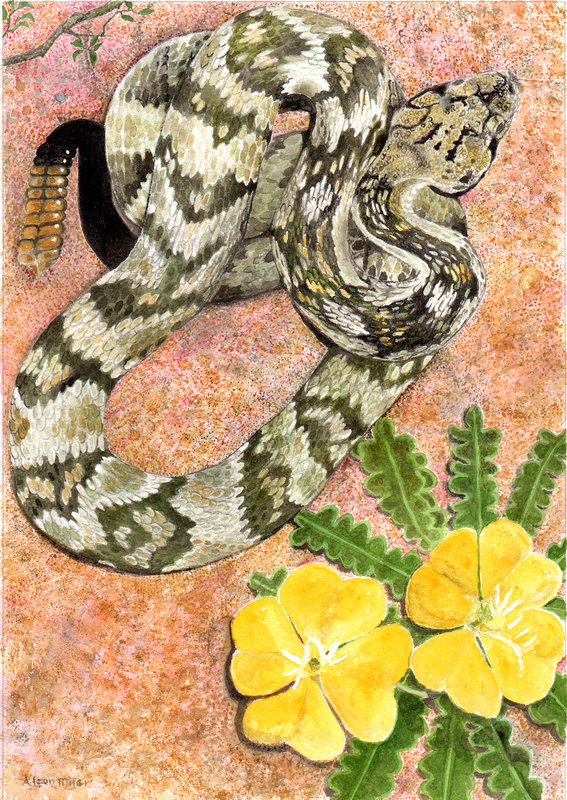 The other 3 rattlesnakes native to where we live in Socorro, NM are: the massasauga (Sistrurus catenatus), the rock rattlesnake (Crotalus lepidus), and the western, or prairie rattlesnake (Crotalus viridis). 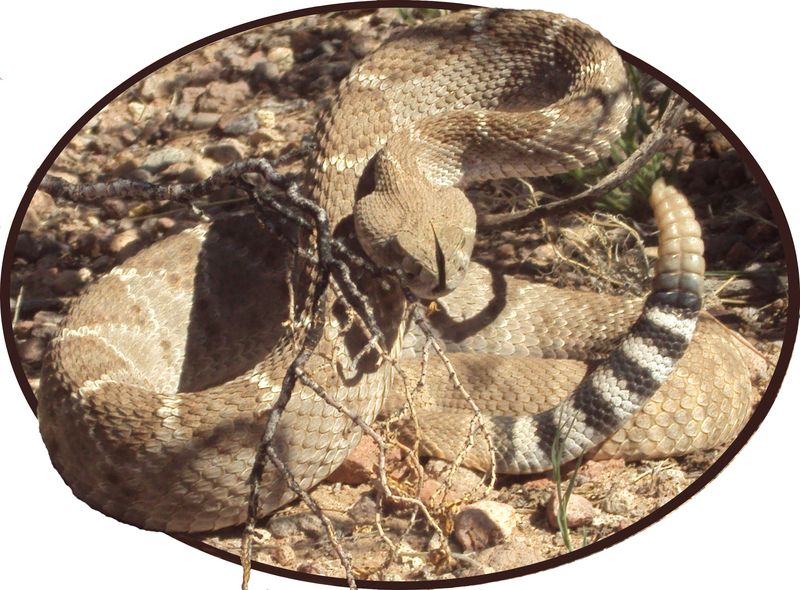 Rattlesnakes are usually active from late March through early November. They will find a rocky place or abandoned animal burrow to den up for the winter, sometimes sharing their dens with other snake species. They are generally slow moving, (you can walk faster than they move), and not very bright. Their main purpose in life is to avoid being eaten, eat rodents, squirrels, and rabbits, and to perpetuate their species. They live alone, they travel alone, and spend a good portion of their life underground looking for food. For all their fearsome reputation, they are not even close to the top of the food chain. Bull snakes eat them, coachwhip snakes eat them, owls and hawks eat them, and roadrunners eat any that are small enough for them to tackle. We usually see 3 or 4 a year passing through our yard, depending on the rodent and rabbit population. They are not aggressive. They do not seek people out, nor do they go looking for confrontation. Being slow moving and dimwitted, the only protection they have is their reputation and their bite. I usually will remove rattlesnakes from our yard to a safe place several acres away. I do this by using a long handled garden rake to herd the snake into a 5 gallon bucket. I then pick the bucket up, using the garden rake, and carry it of at the end of that rake. This actually takes less time than killing them and disposing of the remains. 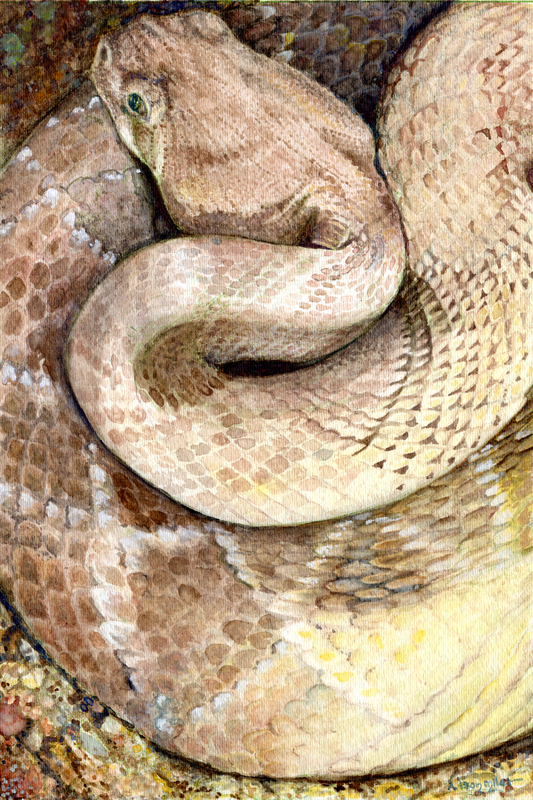 I really, really like your rattle snake paintings. Thank you. It feels odd writing something that is very prosaic and not launching into verbal conceits. If I had to choose between prosaic or conceited, I think I would pick prosaic….